There are many reasons to incorporate chicken breast into your meal plan. The main reason is because of its nutritional value. One skinless chicken breast has zero carbs, is low in fat, low in sodium, and packed with protein which helps fill you up. This alone makes it a welcome component of any weight loss program. Why do you want to include chicken breast in your diet? Eating chicken breast also has a positive effect on your body composition. Increasing your protein intake reduces total body and abdominal fat. It also increases lean body mass and boosts your energy. Another benefit of eating chicken is that it makes you feel good. What? Yep, Campbell’s had it right. Remember when you weren’t feeling well and stayed home from school? I bet your Mom gave you chicken soup. Chicken acts as an anti-depressant. Chicken is high in tryptophan and you experience a sense of well-being after eating your meal. It’s much like the after-effects of a Turkey dinner at Thanksgiving. Because of its value as an excellent source of protein, it also helps maintain muscle mass, helps prevent bone loss, promotes heart health, and boosts metabolism. Chicken breast can be prepared in different ways. It can be roasted, grilled, baked, sautéed, stir fried, and the list goes on. Of course, the way you prepare the chicken will determine the final caloric content and nutritional value. So you need to be careful when trying to lose weight. Grilled, skinless chicken breast is very healthy since no fat is needed for cooking. The meat can be marinated prior to grilling to add a distinctive flavor if desired. Grilled chicken breast is tasty either hot or cold, and can be added to a healthy salad to kick it up a notch. 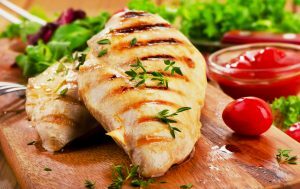 Cold grilled chicken breast makes a healthy base for sandwiches, but fatty dressings such as mayonnaise or salad dressings should be avoided. Look for low-fat dressings as a substitute for mayonnaise on your chicken sandwich or to liven up an otherwise boring salad, chicken or otherwise. Chicken stir fry can be a tasty and healthy dish when combined with oriental vegetables. If you’re going to include rice, be sure use brown rice rather than the white. Brown rice is a healthier choice because of its fiber content. It is also important to avoid rich sauces that are sweetened with sugar since this will increase the calorie content considerably. Soup filled with healthy veggies and chunks of chicken breast is a great way to satisfy hunger on a chilly winter day. Dieters may feel more like braving the outdoors for some healthy exercise after enjoying a bowl of nutritious chicken soup. Regular exercise is essential for healthy weight loss, so getting outdoors for a brisk walk or run is a good way to maximize your efforts of reaching your fitness goals. To wrap this up, chicken breast is a low-fat, high-protein food that will aid in your weight loss efforts. It is affordable, and can be purchased either fresh or frozen. Preparing meals which include chicken breast won’t break your budget as you try out different recipes; and there is no shortage of chicken breast recipes available to you. Open any cookbook or search online; you’ll be overwhelmed at the number of chicken breast recipes you can choose from and experiment with. Chicken breast can be the main course at dinner, but many dietitians suggest the larger meal of the day should be eaten at midday. This allows most of the calories to be burned off before bedtime, so weight loss will occur at a faster rate. Furthermore, a light evening meal helps to prevent cravings for snacks that can sabotage an otherwise effective diet plan. Chicken breast is versatile and easy to incorporate into any healthy meal plan.